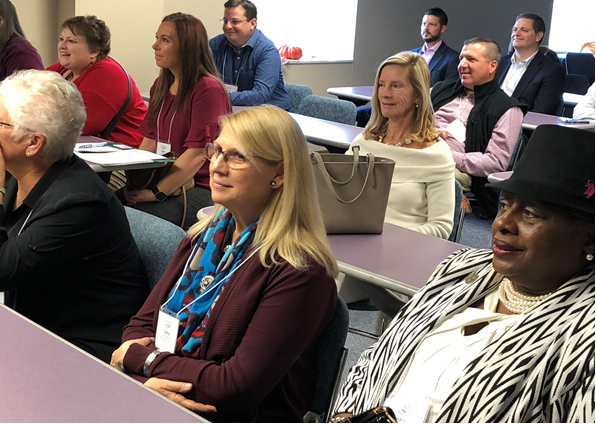 Two dozen county officials from across the country gathered earlier this month in Polk County, Iowa, to participate in a Stepping Up peer exchange. Stepping Up is a national initiative that aims to reduce the number of people with mental illnesses in local jails. More than 450 counties, including 59 in Iowa, have passed a resolution to join Stepping Up since the initiative started in 2015. Polk County was chosen for the site of the second Stepping Up peer exchange due to its innovations in using data to create a collaborative, system-wide effort to reduce the number of people with mental illnesses and substance use disorders in its jail. Reducing recidivism for people with mental illnesses in jails. The Stepping Up framework suggests that having an impact on one or more of the above measures will result in a decline in the jail population of individuals with mental illnesses. Establishing baseline data on each of these measures and then tracking changes over time will show the resulting impact. Through this lens, peer exchange participants heard from representatives from all sectors of the Polk County health, human services and justice systems. To get started, Polk County created its Criminal Justice Coordinating Council (CJCC) in 2008 to review justice-related issues and enhance collaboration among justice system partners. Eleven agencies participate in the CJCC, including representatives from the county’s Board of Supervisors, the sheriff, the mental health services director, the courts and municipal police. The CJCC meets every two months to address acute challenges facing the county and plan for solutions to long-term criminal justice challenges. Through the CJCC and its partnerships, Polk County has been able to put in place key policies, practices and programs to address the four key measures. Polk County has implemented Crisis Intervention Team (CIT) training for law enforcement officers from the Polk County Sheriff’s Office, the Des Moines Police Department and neighboring jurisdictions. CIT is a training program aimed at helping officers identify individuals experiencing a mental health crisis and de-escalate the situation to reduce the need for an arrest or hospital visit. More than 350 law enforcement officers across Iowa have been trained through Polk County. Polk County stands out because of its partnership between local law enforcement, and mental health and medical professionals, including the Mobile Crisis Response Team (MCRT). Established in 2001 through a partnership between the Des Moines Police Department and the county hospital system, the four-member MCRT is designed to assist law enforcement and other first responders on mental health calls for service. The MCRT includes two nurses, one therapist and one social worker and operates from 8 a.m. to midnight. From July 2017 to June 2018, MCRT responded to 2,625 calls that resulted in only 21 arrests (less than 1 percent) and 519 trips to the hospital. Many of the calls were handled over the phone or through another process, including having the call be resolved in the field. The county estimates that the 1,141 calls that were able to be addressed in the field saved the county more than $5.2 million in jail costs. Peer exchange participants toured the county’s Psychiatric Urgent Care Center, a walk-in clinic co-located at the hospital where individuals can receive mental health assessments, counseling and medication management. The center is staffed with psychiatric nurses, and individuals can walk in to receive services. The hospital also operates the Crisis Observation Center (COC), a 24-hour program for individuals experiencing a mental health crisis who are brought in by law enforcement or family members. Development of the COC also provides a “divert to what” option for officers who do not feel that the jail or emergency department are appropriate for an individual in crisis. The COC admitted 93 people who were brought in by law enforcement from July 2017 to June 2018; the county estimates saving $411,180 because individuals were taken to the COC instead of jail. The COC can coordinate systems of care and allows individuals to receive short-term services during their stay. A Polk County Health Services process to integrate and analyze data identifies the most frequent users of its health and justice systems. This “familiar faces” program uses a database created by the IT department to combine data from various health and justice systems to identify these individuals and develop a plan to provide services. To reduce the length of stay for individuals with mental illnesses in jails, Polk County implemented the Public Safety Assessment (PSA) in January 2018 as part of a statewide pilot program. Using evidence-based risk factors, the PSA determines the likelihood that a defendant who is released before his or her trial date will fail to return for a future court hearing, commit a criminal act or commit a violent crime upon release. The PSA is now used at all court hearings in Polk County. With the PSA, the county developed a decision-making framework to provide guidance on how judges can use the results of the assessment. Following this framework allows for consistent application of release terms for all defendants and reduces the county’s reliance on bail money, thus minimizing the pretrial detention of people who are considered low risk but who are still detained due to their inability to pay bail. Often, people with mental illnesses will fall under this category. An officer at the jail completes a “Brief Jail Mental Health Screen” during the booking process, to identify any symptoms of mental illness, and the medical provider also screens individuals. If at any point a potential mental illness is identified, a referral to the mental health team is made, and the individual is typically seen within 72 hours of intake. As part of the county’s mental health jail diversion program, a case manager receives this information and uses the results of these screens to determine eligibility for the diversion program. This information, coupled with the results of the public safety assessment, is helping to get individuals out of jail faster and connected to appropriate services, while allowing the county to manage risk, ensure public safety and promote a fair justice system. Increasing connections to treatment once a person is released from jail is another key component of Polk County’s efforts. Polk County Health Services works closely with its provider network to offer a variety of services to people with mental illnesses who are leaving jails, including medication management, Forensic Assertive Community Treatment and housing and respite services. Polk County uses value-based contracting (or pay for performance) with its providers to encourage the use of evidence-based practices and a focus on outcomes, not just outputs. Providers are also given the option to participate in the county’s Positive Behavior Support Network, which provides them with tools and trainings to better serve individuals in a way that focuses on positive behavior and lifestyle changes over punishment. The intention of the network is to reduce jail days, increase employment, encourage peer-to-peer support, increase empowerment and ultimately improve the quality of life for people through addressing all these pathways. Participants also toured the SafeNetRX facility located in Polk County. SafeNetRX is Iowa’s and the country’s largest drug donation repository. Funded through the state health department, the repository receives donations of prescription drugs that are then inspected for safety and quality to redistribute back to Iowans who are in need of medication assistance for little or no cost. Polk County partnered with SafeNetRX, to create the Behavioral Health Justice Program. Through this program, qualified individuals released from the jail who are unable to pay for psychiatric medications are eligible to be connected to primary health care services and receive 30-day supplies of medication for up to six months at no cost. Having the components in place is helping Polk County better meet the needs of individuals with mental illnesses before and after they have contact with the justice system. Providing case management and supports such as housing and access to treatment is shown to reduce recidivism and have a positive impact on individuals’ well-being. Polk County’s reliance on data and partnerships has produced positive results for some of the county’s most vulnerable and most resource-intensive residents. Stepping Up was started in May 2015 by NACo, The Council of State Governments Justice Center and the American Psychiatric Association Foundation. This peer exchange was supported by Janssen Pharmaceuticals Companies of Johnson & Johnson. Jessica is a Justice Associate at the National Association of Counties (NACo).